and heartwarming essays, all with a tenuous tie to Christmas, and pairs each with a delicious drink recipe. So grab your martini shaker and get ready for tasty cocktails and hearty laughs this holiday season! A humorous collection of holiday-inspired stories with Christmas drink recipes. 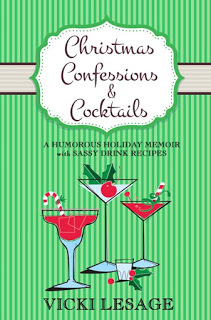 If you’re looking for a great read this holiday season, don’t miss Christmas Confessions & Cocktails! The 25 stories in this holiday collection take you on an adventure full of Christmas spirit (and spirits, including Christmas cocktail recipes like Christmas Cookie Martini, Peppermintini, and Glitter & Gold). And it makes the perfect Christmas gift! You know the stereotype that French women don’t get fat? The most annoying thing about it is it’s pretty much true. Not that they’re all stick-thin, and not that there aren’t any curvy ladies in France. Just that overall, French women fall within the “normal” range. Of course, “normal” is relative! I’m a US size 8 but I often wear size XL in French fashions. One time I was shopping and found this adorable sweater but the large wasn’t large enough. So I headed to the sales counter where the lovely shop assistant told me they could order a different size for me. “What size will you be needing?” she asked, way more loudly than necessary. “Um, extra large, please,” I whispered. “Extra large?” she shouted, as the entire store turned to scope out the extra large lady at the checkout. Me. How embarrassing. Some stores don’t even carry sizes larger than a 10. But let me tell you, during the holidays, if I’m not careful, my size 8 booty could easily need some size 10 jeans. If you’re anything like me (and NOT like the French), you eat more during the holidays. From cookie exchange parties to office shindigs to family dinners, we’re all eating more than usual. Even the cookies we set out for Santa threaten to make our bellies shake like a bowl full of jelly. Not the French. First, their office parties tend to have petit fours, which is French for “appetizers way too small to fill you up.” They’ve never heard of cookie exchange parties. And while the French will indulge in Christmas dinner, they tend to eat light the rest of the day (sometimes the rest of the WEEK) to make up for it. As for cookies for Santa? Get this: They set out CARROT STICKS for the REINDEER. So, yeah, it’s no wonder French women manage to stay thin even during the holidays. So unfair! However, maybe they’re on to something. Because when the New Year rolls around, while I’m vowing to shed a few pounds, they’re carefree and lightweight and happily fitting into their pre-Christmas jeans. This holiday season I might try not stuffing my face. But I’m definitely not leaving out boring carrot sticks for the reindeer. Maybe a slice of carrot cake for Santa instead? I’m a math nerd with a sense of humor. I love drinking, zombies, and telling ridiculously long stories. When I’m not chasing after my two energetic bundles of joy, I like to squeeze in a little writing time. 2. Tell me about how you became a writer. I’ve been blogging since before most people knew what blogging was (which doesn’t make me cool, it just makes me old!). At the urging of my mom and my drinking buddies, I finally took the plunge and turned my stories into my first book, which was way too much fun to write. 3. Give readers a little introduction to Christmas Confessions and Cocktails. I love Christmas and I love cocktails, so I figured, why not mix them together for the next book in my Paris Confessions series? I also thought it would be fun to try writing on a theme as opposed to writing in chronological order like my other books. The result is a collection of 25 holiday-inspired stories, each with their own cocktail recipe. 4. What is the writing process for a book like this? What comes first, the short story or the cocktail? The math nerd in me takes full advantage of spreadsheets. I started out brainstorming my best Christmas stories. Then I grouped them into themes: weird food, travel disasters, getting in the Christmas spirit, gift giving, crazy family scenarios, etc. From there I could see which sections needed more stories, so back to brainstorming. Once I had a list of the 25 stories I wanted to include, I started writing. I created the cocktail recipes after each story because I really needed to see where each story went before I could find a cocktail to match the theme. I mean, I guess for the one about bugs I knew I’d do the Grasshopper Martini, but for some of the other chapters I could only be inspired to create the cocktail once I’d actually written the story. 5. You have some amazing cocktail recipes in this book. What’s the secret to making a great original cocktail? 6. What are you working on now/next? I have many more ideas for the Paris Confessions series, but before starting on the next book, I plan to focus more on the publishing house I co-founded, Velvet Morning Press, because we keep receiving GREAT submissions and I want to be able to publish these fabulous new voices. I’m also working on my first chick lit book, but I won’t say more about that until I’m a bit further along. Mika stared back at me blankly. No wonder the French are so skinny. If that was the tradition in the U.S., not only would we have less of an obesity problem, but I might not have ever figured out Santa wasn’t real. Each Christmas, Stephen and I would faithfully set out cookies and milk, selecting different treats each year so that Santa wouldn’t get bored. “Should we give him Oreos or Pitter Patters?” I asked my four-year-old brother one holiday season. “Yeah! Mommy, can you please buy Chips Ahoy for Santa?” I asked. Except she didn’t. ’Twas the night before Christmas and all through the house, not a Chips Ahoy was in sight, nor Nestle Tollhouse. “Mommy, what’s this?” I asked, eyeing the plate of Fig Newtons set out next to a glass of water. Nobody liked Fig Newtons except Mom. And water? Who preferred water with cookies when you had the choice of milk? Except for Mom. At six years old, I wasn’t 100% positive about my assumption. Plus, I didn’t want to sabotage my chance of getting gifts if there really was a Santa Claus. I decided to play along, just to be safe. The next morning, bountiful presents were packed under the Christmas tree. Whew, Santa had come after all. But then I discovered a second clue. “Mommy, Santa Claus has the same handwriting as you,” I said, pointing to a gift tag. “Yes, that is funny.” I was on to her but didn’t want to ruin Stephen’s fun. If only we had set out carrots and water for the “reindeer,” we kids would have never been the wiser. Because if there’s one thing Mom likes more than Fig Newtons (and one thing even more boring than Fig Newtons), it’s carrot sticks.